(Photo: LWF / Leonardo Pérez)The ordination of Rev. Hanna Schramm in Santiago de Chile in April 2014. 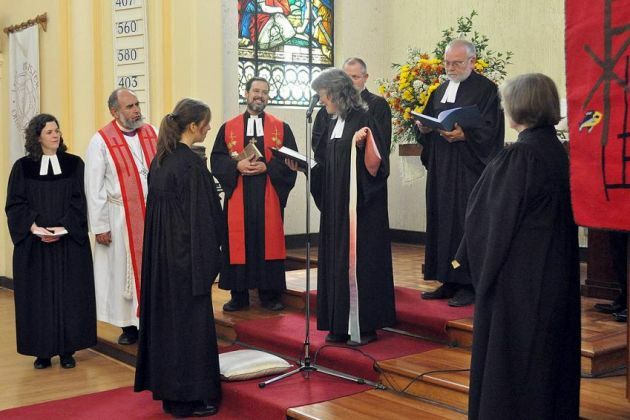 The Lutheran Church in Chile has ordained Rev. Hanna Schramm as its first woman pastor, breaking the glass ceiling for female ordination in Latin America and the Caribbean. The Lutheran World Federation said in a statement Monday that the ordination now means all LWF churches in the Latin American and Caribbean region now embrace women ministers. "The ordination of a female pastor in the ILCH (Lutheran Church in Chile) is of relevance for the entire communion of churches in the LWF," said Rev. Patricia Cuyatti, the LWF's mission and development secretary for the Latin America and Caribbean region. "It invites us to engage women from different backgrounds to explore ministry from their life experiences and contribute in witnessing the relevance of living liberated by God's grace to serve." Born in Dresden, Germany, Schramm studied theology in Leipzig before completing a two-year vicariate in Chile. The LWF said she was ordained last month in the Church of the Redeemer in Santiago de Chile by Bishop Siegfried Sanders of the ILCH. "I want to express gratitude for the journey that made possible the ordination of the first female pastor in our church. We thank Hanna Schramm for her courage, sensitivity and courtesy during her vicariate, which made people appreciate her service," Sanders said. The bishop noted, "We realized that many people who had doubts and reservations regarding the service of a female pastor have been changed by Hanna's ministry. For the ILCH, this means a change of mind, openness, and a more inclusive theology. The ILCH has moved to another time, to the reality of today." The gender policy of the LWF, which represents more than 70 million Lutherans, stresses its commitment to the empowerment of women and gender equality both within the LWF and wider society. Schramm said she hopes her ordination will also encourage women in Chile to study theology and join the ministry. "The fact that a woman has come along and has been ordained and accepted as a minister is certainly a great contribution towards encouraging more young women to be interested in this calling. They can see that this possibility is now open to them as well," Schramm said.